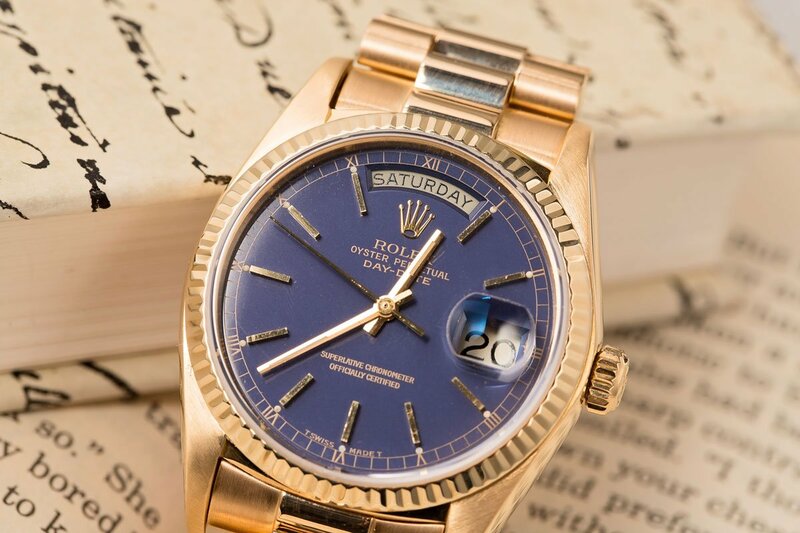 Officially called the Day-Date, but better known as the Rolex President, this is the ultimate grail watch for many collectors. 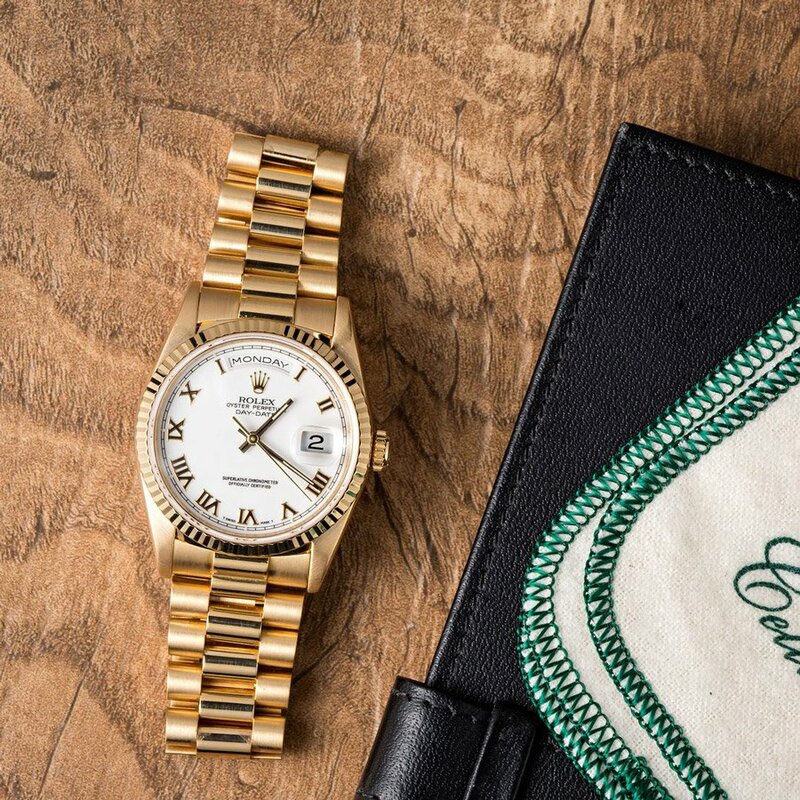 Exclusively offered in precious metals and sporting an instantly recognizable dial with a pair of calendar windows, the Day-Date has been Rolex’s flagship watch since its debut in 1956. Today, we’re comparing the last three generations of the 36mm version of the Rolex Day-Date President to highlight how the model has evolved over the last four decades. A vintage Rolex Day-Date President ref. 1803 – notice the “pie pan” dial and acrylic crystal? 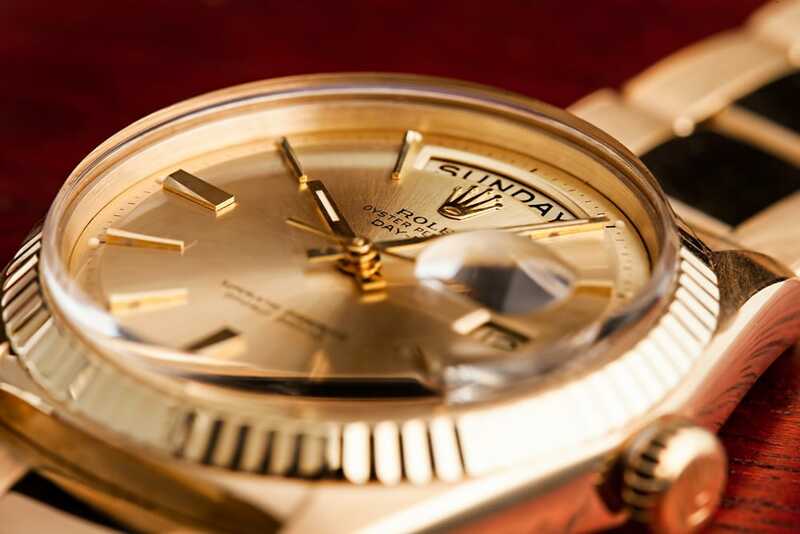 The 180xx series was the first Rolex Day-Date President to be fitted with a sapphire crystal. Rolex introduced the five-digit Day-Date 180xx family of watches in 1977 to replace the preceding four-digit Day-Date 180x models. While this generation of President watches retained the fundamental design of the model – the 36mm Oyster case, the day and date windows at 12 o’clock and 3 o’clock (respectively), and the President style bracelet – the crystal was now constructed from scratch-resistant sapphire (rather than acrylic), and the “pie pan” dial was replaced by one with a flat surface. Additionally, hidden beneath the caseback was a brand-new movement that would improve the day-to-day practicality of the watch. Powering the Day-Date 180xx watches is Rolex’s Caliber 3055 movement, which not only brought about a higher frequency of 28,800 beats per hour, but also introduced the quickset date feature. A “quickset” date means that users can adjust the numerical date value entirely independently from the center hands, thereby eliminating the need to continuously rotate the hour and minute hands to set the number that is displayed inside the date window. The 182xx series added a quickset feature for both the day and the date complication on the Rolex President. In 1988, Rolex unveiled a new generation of the Day-Date President, this time with the 182xx series of five-digit reference numbers. Yet again, these watches ran on a new movement, and this time it was the Caliber 3155 – a movement which Rolex still uses today. The Caliber 3155 introduced the double quickset feature to the Rolex President collection, meaning that both the numerical date and the day of the week on the Day-Date 182xx models (183xx with diamond cases) could be set independently from the central time-telling hands. A Rolex Day-Date President ref. 118205 with a smooth bezel. Finally in 2000, Rolex presented the most current version of the 36mm Day-Date, which carries six-digit, 118xxx reference numbers. 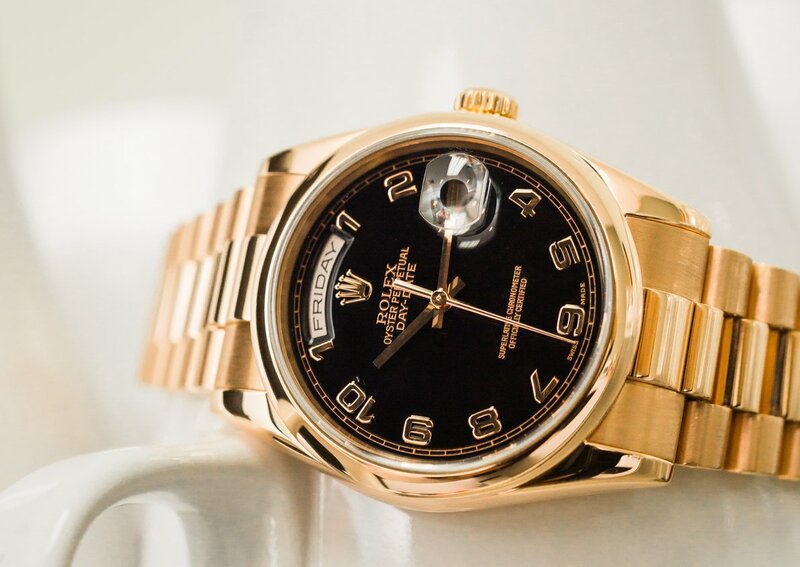 Still powered by the venerable Caliber 3155 movement, the latest generation of Rolex President watches included exterior enhancements such as heftier bracelets, high-polished lugs, and more secure clasps. The Day-Date 118xxx family is also the most varied President collection to date. There are versions in yellow gold, white gold, Everose (pink) gold, and platinum. Plus, bracelet options include the iconic President, the sporty Oyster, and an assortment of colorful leather straps. All that, coupled with the wide choice of dial designs and bezel styles, yields countless configurations to choose from to create the perfect Rolex President to suit your taste. Regardless of which generation of the Rolex President you decide to wear, these watches are the embodiment of prestige. It is a way to convey personal success and great taste without having to say a single word. 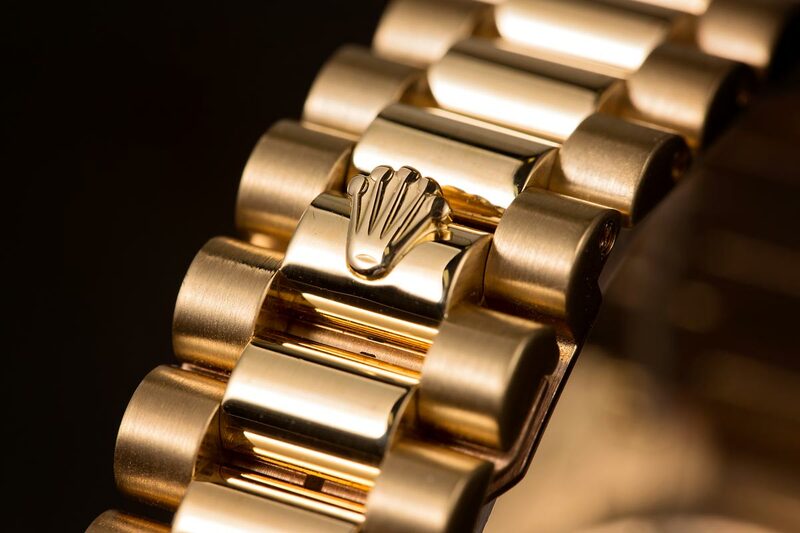 The Crownclasp on the President bracelet of a Rolex Day-Date.